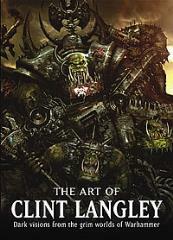 Clint Langley is a well–known figure in the world of science fiction and fantasy art. His illustrations for the Black Library, creating jaw–dropping images for the Games Workshop worlds of Warhammer and Warhammer 40,000, has become a fine body of art. Creator of numerous novel covers and over a hundred collectable card game images, Clint’s work has wowed Games Workshop fans for years, his hyper–real style and gritty sensibilities perfectly in tune with the grim vistas he portrays. Together with commentary by authors such as Dan Abnett and Graham McNeill, this fantastic collection, dedicated to the dark worlds of Games workshop, is exhibited in full color and for the first time.